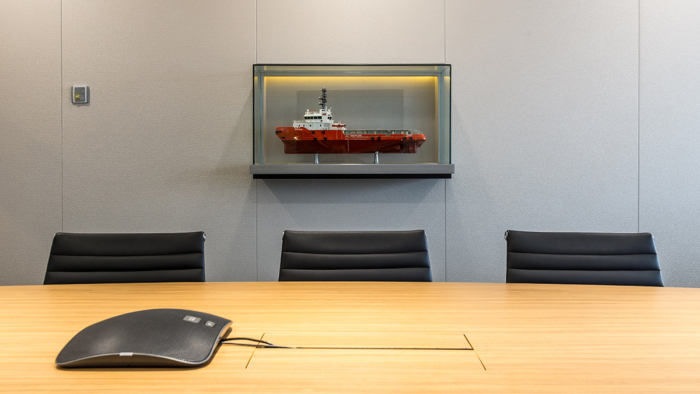 Sennex Consultants have designed a new office space located in Singapore for Swire Pacific Offshore. The Marine Industry and Swire Pacific Offshore’s continuous improvement journey provided inspiration for Sennex’s concept team. Movement, growth, reflection, rhythm and change were key drivers for Sennex’s design exploration and conceptual development. A timber wave wall in reception symbolizes a ship’s bow wave whilst the granite reception desk, marble flooring and timber veneer wall project the strength of the Swire brand. Colour is used as a way-finding tool and, to create visual interest. An ‘activity-based planning approach’ was adopted whereby employees are provided with a series of work settings that they can use as opposed to a single office or cube. Each work group benefits from both semi-private and enclosed collaborative spaces and, privacy rooms for focused work or calls. A centralized meeting hub houses the formal meeting spaces which comprise; stand-up meeting rooms, project and VC facilities and traditional meeting rooms.